Back pain is a problem that more and more people face these days and it can make your life absolutely miserable. Choosing a good mattress is not enough to deal with it. Luckily, there are options available, and getting a massage is one of the best things to do – but not everyone can afford it. I had a lot of clients who came in for a few appointments and always talked about how it does wonders for their pain. However, sooner or later they would ask if there’s a way to make it all easier and cheaper. Well, there is – back massagers are a great alternative to traditional massages, and they can help make your life easier and pain-free. Today I’ll look at some of the best ones, so stick with me! Getting an electric massager for back pain is not a huge investment, but you might still be hesitant about it. After all, can it be as good as a regular massage and is it honestly more convenient? Those are not unreasonable questions to ask – so let’s answer them and take a look at just some of the benefits that you will get from a back massager. The best thing about getting a back massager of any kind is the portability. You can use it almost anywhere – in your home, your office, your car and so on. You don’t have to make an appointment and spend hours on a massage. It doesn’t take much time and can be done anywhere. As soon as you start feeling pain and tension, you can start working on it, which helps a lot. Have you ever been at that one massage parlor where the masseuse just refused to go easy on you no matter how much you yelled? I sure have, and more than once. With a back massager, you won’t have to deal with that. You can set it to any type of massager or intensity that you want and have exactly the massage you want and need. In some ways, that beats traditional massages, easily. Let’s be frank – massages are expensive. Even the most affordable ones will cost you a fortune, long term. Back massagers, on the other hand, cost far less and you’ll be able to use them for months or years after paying for them just once. You won’t have to worry about fitting the massage payment into your budget each week. If you don’t have the time to read my more detailed reviews, don’t worry. Here’s a quick comparison of my top 11 models that you can check out right now. Now I’ll move on to more detailed reviews, and you’ll see just why I picked these 10 as the best back massagers and get all the info needed to choose the best one for you. If you want a pure neck massager with no strings attached – this is probably your best bet. In fact, I’d even go as far to say that it’s probably the best neck massager of this style. With its 4 strong massage nodes and superb shiatsu massage action, it is great at relieving tension and pain. 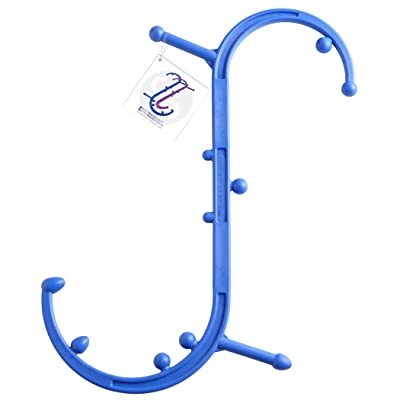 The best thing about it is that it’s highly portable and easy to place on any chair, sofa or recliner – it will even fit nicely on your car seat. Don’t worry; it comes with a car adapter. I only regret that the cord is so easy to detach accidentally – otherwise, it’s amazing. Even if a massager specifies that it’s only a neck or a back massager there’s no reason you can’t try it out on other body parts that are hurting. Just make sure not to use it on any spots that a massager is not intended for and you’ll be good. This massage pillow features an incredible 8 massage nodes, more than most others on the market. It’s primarily a neck massager, but it can be used for other areas of the body, and I’ve found it to be probably the best back massager for lower back pain. The massage heads are able to cover all the muscles and massage them evenly, providing true relief. You can use it anywhere, including your car and it comes with an adapter. It’s also highly adjustable and has a heating function for getting warm during those cold dark days. Lying down is the standard position for getting a massage, but not necessarily the best. Standing up straight while getting a massage is quite a different experience and it might be the one for you – with massagers like this, you can test that out. Handheld massagers get a bad rap for being underpowered and useless, but this one aims to change that. It’s quite intense, delivering up to 3600 pulses per minute and has 3 different strength levels. The five different attachments, including a curved head, give it exceptional versatility – it can be used almost anywhere on your body. It’s a great deep tissue massager, and the only issue I have with it is the low battery time. But, it is cordless and easily rechargeable. While even the best handheld massagers have a reputation for being underpowered, it’s worth taking a chance on one since there are powerful ones out there and the convenience and control that you get with one of them is invaluable. If you’re looking for a full back massager, this massage chair pad is one of the best options for you. It has a headrest with 4 nodes for neck massaging and an additional 4 nodes in the backrest. They all deliver deep tissue massage in the shiatsu style. 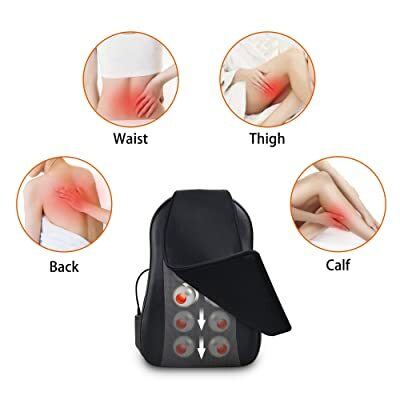 Your whole back can be massaged by this massage pad, and it even has an optional heat function that will help relax you. 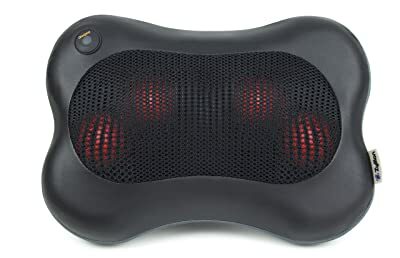 I quite like it, and it’s probably the best back massager with heat function on the market. There are also options to focus on certain parts of your back – upper back, middle back, and lower back. You can use it on the sofa, an office chair, a car seat, or anywhere else you like. It’s probably the best back massager for chair-like objects. One of the reasons why regular massages sometimes feel better than those delivered by machines is because of the heat from the masseuses hands and the friction. Massagers with a heating function can replicate this and make the massage feel much better than it otherwise would. It almost seems like this shiatsu massager has it all. It can be used for your back on a chair, but it can also be used for other body parts, including your legs and your neck. You can carry it with you easily – and it is cordless and can be used for 70 minutes. It also features a heater function. An adjustable full back massager that you can take with you! The 4 nodes can travel up your entire back and massage it fully or focus on one spot, whatever you choose. It also has two intensity levels. The only negative I could find is that it doesn’t come with a car adapter, but that is something you can easily purchase. Most people don’t consider taking their massagers on the go with them, but you sometimes need the relaxation that a massage provides at places other than your home. Getting a massage while working in your office can be much more beneficial for your back than just getting one when you come back home. One of the negatives of electric massagers is that they spend power, but this s-shaped cane massager uses only your own muscle power. 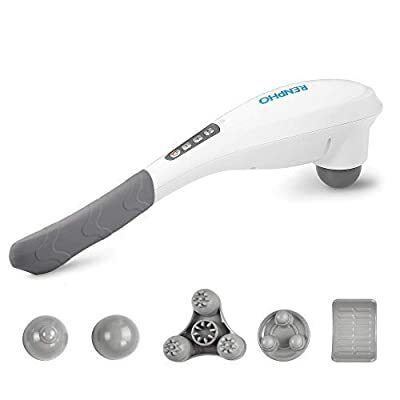 It’s a handheld massager with 11 therapy knobs that you can use to massage almost any part of your body – from your head through your painful hips to your soles. You’ll find that it’s extremely durable and hard, yet light. You can massage your body with it as strong as you like, so you’re in complete control. The instruction manual is full of useful massage techniques that you can perform with it, so I suggest you read it in full. That way, you’ll see the true potential of this great DIY massage tool. Sitting down and getting a relaxing massage experience is nice, but it’s not always the best route to take. You know your body best and getting more involved in the massage process with tools like this can benefit you more than you might realize. 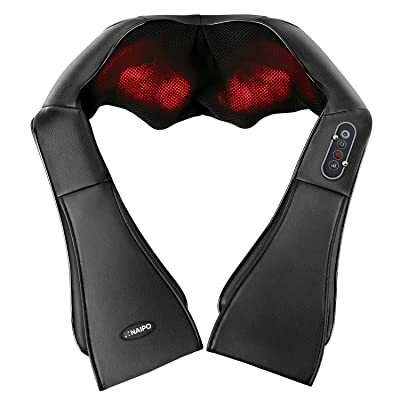 Within this shiatsu neck massager are 4 small and 4 large massage nodes, allowing for a wide variety of massage modes. It also features 3 different levels of intensity, allowing you to completely control the type of massage that you get. The 3D shiatsu massage is especially useful since it will cover every inch of your neck and ensure a thorough massage. Besides that – it also has a heating function that works well at relaxing your muscles. The only issue with it is that it’s not cordless and the cord is quite short, which I found to be limiting. Did you know that Shiatsu massage is basically like acupuncture without the needles? A Shiatsu massage can easily replace acupuncture for those who are more squeamish about it, allowing you to get the same results with less pain. Among handheld massagers, this is by far one of the most adjustable ones. It comes with 6 unique head attachments, each designed for a different body part, allowing you to get exactly the type of massage you need. The intensity is good – and there are 6 different strength setting, allowing you to customize your experience. It’s also cordless and easy to recharge while lasting up to 100 minutes on full charge. If you’re looking for the best hand massager, this is probably it. When you’re using your massager, don’t stick to just one strength setting, even if it seems to suit you the best. Experiment with settings that might feel uncomfortable at first since they might bring you better long-term results. With this neck massager, you get pretty much all the functions you would expect – 2 directions, 3 intensity levels and a heat option. It has 8 massage nodes – and it offers a few different massage modes. It comes at quite a low price, though, and with a 3-year warranty, so it’s a risk-free purchase. It’s super easy to use for anyone, and all the buttons are easily accessible. I do wish the heating function heated up a bit more, but that might just be my preference. There’s a stigma surrounding massagers that are on the cheaper side, but they can be just as good as more expensive ones. Try them out before dismissing them solely based on their price point. You get 8 deep-kneading massage nodes in this neck massager for a full shiatsu massage experience. The 3D massage can be set up to suit your liking with 3 different speeds – and there’s an inbuilt heater function. It’s quite an affordable massager when everything is considered. The purchase is also risk-free since you can return it, no questions asked, within 30 days of purchase. While it’s not cordless, you get a nice length of cord with it and a car adapter, allowing you to use it on the go. Finding the right massager is difficult, especially since you can’t try them out for a long time before you buy them. Deals like this one are great since they let you do that and you get your money back if you’re not satisfied. 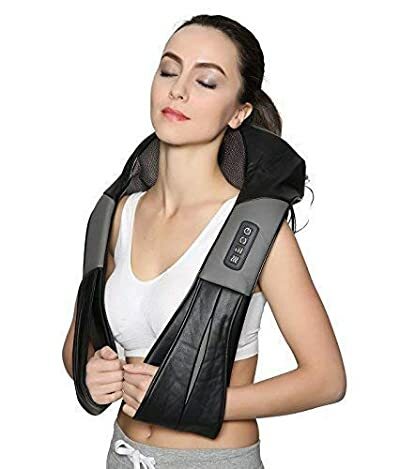 This Brookstone back massager is reasonably priced for what it offers – a through massage with a few different modes and even a heating function to soothe your sore muscles. 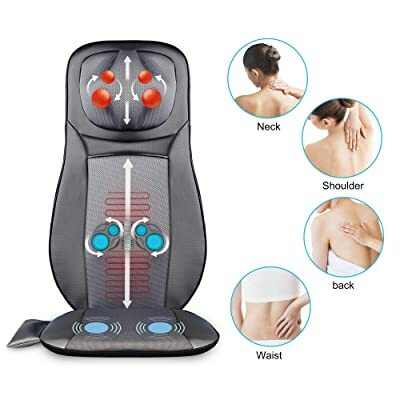 There are 8 massage nodes in total covering your body from all direction – You can reverse the direction in which they’re massaging just by pressing a button and it’s incredibly easy to use. It comes with a long cord so you’re not stuck sitting next to an available outlet and can use it on the sofa, the bed or anywhere else in your home. Overall, the brookstone back massager is a great deal for the price. Using extension cords with back massagers is usually fine but you should always be careful not to overload the extension cord. The electricity could transfer through your massager to you. Cheap store-bought car or USB adapters can also be a hazard. I know that buying a back massager can be a bit difficult – massages don’t show their benefits for a while and it’s not like you can try these out at the store. Still, there are a few things you can watch out for that will ensure that you get the right one for your sore back and neck. Here are my tips for you. The most important thing to consider when getting a back massager is the type of massage that you’ll need. Which location is the problem and why? Are you experiencing sharp or dull pain? Is there a lot of stiffness there or just tension? These are all questions you need to ask yourself – and your physician or physical therapist, if possible. 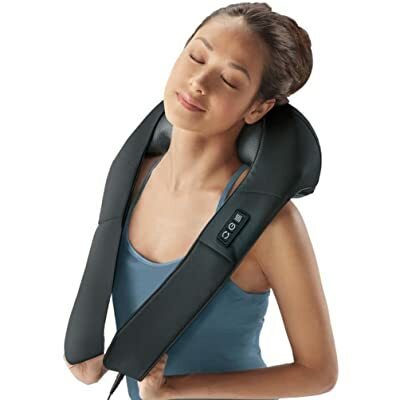 Massagers that utilize shiatsu techniques are usually the most realistic ones. They’re also the best deep tissue massagers. A device that uses a kneading motion will probably be the best back massager for knots that you can get. If you only have problems in your neck area, getting a massager just for that is a good idea. However, if you have problems across your entire back, a full back massager is what you want. Those are just examples, but you get the idea – pick the right tool for the job. Depending on how you want to use your massager, considering the power source is quite important. Massagers that work on batteries are much easier to take on a trip and use in a bus, for example, or in your car. Rechargeable lithium-ion batteries are probably the best choice. Corded massagers aren’t as portable, but they are usually more powerful. Some corded massagers come with a car adapter, so they can be used in your car. With corded massagers, you also need to consider the voltage and see if it fits your power outlets. If you have a mismatch, you won’t be able to use your massager at all. But even the best electric back massager can run out of power – massagers that use only your arm strength will always work. Consider your needs and choose carefully. Do you want to use your massager at home or in the office? Maybe you want to bring it with you on a bus ride or a car ride? There’s a lot that you can do with your back massager if you get the right one. For use in the car, you’ll probably want a full back massager. On the other hand, you’ll probably want to try and find the best handheld back massager available for use on the go. Pick the style that fits the place where you want to use it. While I always value a massager that provides me with some good back rubbing to be better than a high-tech one that does squat, additional features are still important. Things like auto-shutoff features, automatic adjustments, pre-programmed modes, heating functions and more can make a good massager even better. Always check out what the massager can provide in terms of extra features and consider if they’ll be useful to you. Lastly, it’s important to consider how good the price is. Now, I don’t mean just the flat price listed on the box – this includes the purchasing conditions. Some massagers have an option to be paid in rates over a period of 6 or 12 months, which can be a great option if you’re on a tight budget. Others have good return policies, which is always beneficial. Trying out a massager over a couple of weeks is probably the best way to determine if it fits you, so buying one that can be returned, no questions asked, is always a good idea. This is a difficult line to straddle, as I’ve found out. I happened to recommend some massagers I thought were great, to some of my older clients, thinking they’ll love them. They hated them. I like my massagers to be highly adjustable, so I can make the most out of them. However, not everyone feels that way, and for some, a simpler machine that’s easier to use is the right way to go. It all depends on you – do you want more options or do you like a device where you only need to press one button? Over the years, I’ve had a lot of questions from people about massaging. How is it useful? Is it the same as acupuncture? Does it even do anything? Isn’t medicine just better? Isn’t buying a good mattress for back pain the solution? And I understand those people – massaging is often bundled in with other ‘alternative’ health treatments, and most of them are useless. It also takes a long time to see the positive effects of massaging and a lot of people give up before that. So, to dispel those doubts, I’ll present you with just a few of the most important benefits of getting regular back and neck massages. I know most people suffer from some tension, especially in the upper back and neck area. The reasons for this are numerous – long periods of sitting, sleeping your side without proper support, bad walking posture, etc. Massages loosen and relax your muscles, thus getting rid of the knots and the tension along with them. It takes time, but it does the trick. A massage stimulates the muscles, just like when you’re exercising, only to a lesser degree. This improves the blood circulation in the muscles, allowing for more blood and thus, more nutrients and oxygen to get to them. This will naturally revitalize your muscle tissues, improving their healing and reducing the risk of infections or inflammation. When you have sore joints, this will also make your muscle more flexible, improving your range of movement and reducing pain. Your back and neck pain, and even headaches can easily be caused by your muscles being misaligned or having constant spasms from knots or inflammation. This can have a knock-on effect, and you could start feeling pain through other parts of your body due to the tense muscles in your back. Your spine might even become misaligned due to the muscles not supporting it properly, so sleeping on your back will feel awkward and painful. Regular massages will reduce these issues, thus easing the pain you’re constantly feeling. Getting the best back massager for knots will improve your entire disposition. Even if you’ve learned to tune out the dull pain and tension you feel in your back and neck, it’s still there, and it’s still causing stress. This can lead to poor sleep or even insomnia, even if you choose the best sleeping position you can. By reducing the tension and pain in your back and neck, massages will help you get a good night’s sleep and truly relax. I know that back massagers seem simple – almost deceptively so. That’s why it’s easy to make a misstep and harm yourself with them. Here are a few general tips about what to do and what to avoid doing with your back massager. Read the instruction manual carefully before ever using your massager. Use your massager on body parts that are not mentioned in the instructions. Seriously, don’t do it. User your massager when you feel that you need it while following the general guidelines from the manual. Use your massager all the time – overuse can cause your muscles serious harm instead of helping them. Use your massager on the areas where you feel tension and pain, to relieve them. Keep using the massager if it causes you pain. Stop and find out why it’s happening. Massage the spots of chronic injuries that keep bugging you to help with the pain. Use your massager on fresh injuries since that will only make them worse. Wait a while before you include massaging into the recovery process. Can I use a back massager in the car? Yes, of course. Some of them are even designed with that in mind and come with car adapters – they’re also molded to fit a car seat. However, using a back massager that’s not designed for use in the car – like a handheld massager – can be a problem. If you’re driving, only use massagers that you know won’t interfere with your ability to drive properly. Always test out the massager in your garage or a parking lot before trying to drive with it on. Is a back massager dangerous? When used properly, it’s not dangerous at all. However, like anything else, it can be a severe safety hazard when used improperly. I’ve heard stories about people using their massager in locations that weren’t recommended and let me tell you, it never ends well, and it isn’t pretty. It can also be dangerous if used by certain groups of people – for example, people with blood pressure problems, those with pacemakers, diabetic people and so on. Stick to using your back massager as instructed and it should be completely safe for you and your family. Can I use a back massager while pregnant? I know that back and neck pain is a huge issue for pregnant women, but unfortunately, massages are often too risky during pregnancy. You can use a back massager or, even better, get a prescribed massage, but only if your doctor allows it. Never use any type of massager on your own while pregnant and always consult your physician beforehand to ensure that you and your baby stay safe. Is it safe for children to use back massagers? It depends on the age of the child. I know people who’ve tried to use their massagers on extremely young children and that never ended well. Using it on babies is particularly dangerous – the vibrations can break their bones or kill them in the worst case scenario. Never do that. When your child is around 7 to 8 years old, it should be fine for them to use a back massager, but you still shouldn’t let them use it unsupervised. Should I use my back massager on bare skin or over clothes? Again, it depends. Some of them, like the best handheld massagers, are recommended for use on bare skin, preferably with lotion or oil applied. Others, like most massage cushions, can be used both on bare skin and over clothes. However, using them over clothes is usually a bit better since sweat, and dead skin won’t stain them. Follow the instructions for your back massager to make sure you’re doing it properly. Why does my back hurt when I use a back massager? There can be a few different reasons for this. The most common one is that you’re not using it properly – always consult the manual. Other reasons could include – the massager being too intense for you, recent injuries, overuse, medical conditions and so on. If this persists even if you’re using the massager correctly, stop using it and consult with your doctor. Can sleeping on a back massager hurt my back? Yes, it can. Most back massagers have an auto-shutdown feature to prevent this, but not all of them have it so be careful. Back massagers are not good for sleeping on, so avoid it and sleep on a soft mattress instead. How do I wash my back massager? This can be a bit tricky, but it’s not too difficult. For the most part, these babies can be wiped with a slightly damp cloth and left to dry out for a few hours or a full day. That’s enough for regular cleaning. Some massage cushions will have a removable cover that can be washed by hand or in the washing machine. That’s usually not the case though. For more persistent stains, you can carefully scrub them with a sponge while using a non-abrasive, non-acidic cleaning agent. However, even that can be dangerous so try to avoid staining it as much as possible. Is using lotion with a back massager dangerous? Not at all, as long as you’re using it properly. Some back massagers and massage cushions even come with lotion included. Just make sure to check the instructions and apply the lotion as instructed. Final Verdict: Which Back Massager is the Best One? There you have it – that’s all I can tell you about back massagers. Thanks for reading and I hope I managed to help you out. But wait, there still more I could tell you – and that’s my pick for the best back massager out of the bunch. 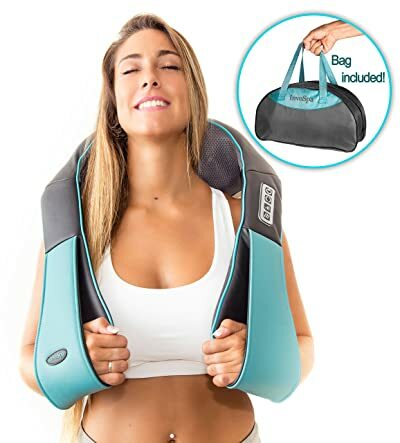 I think that Snailax Gel Shiatsu Neck & Back Massager is the best back massager 2019 has to offer – it just has such a wide range of useful functions that you can’t miss out on! It’s the best electric massager for back pain! What do you think? Do you agree? Sound off in the comments and tell me all about it. Lovely posting !! Felt good to read this article. It gives me some great Information that I’m looking for and I hope you have a great knowledge about It. Thanks and keep sharing ! !